Musco Center emerged in March 2016 as an iconic and beautiful home for the arts for Chapman University and Orange County. The elegant, new performing arts center had seemingly sprung fully fledged from a verdant corner of the Chapman campus. The first salvos were a Grand Opening Concert and a vibrant Community Open House and Arts Festival featuring artists and organizations from the surrounding region. During the Grand Opening, opera legend Plácido Domingo was surrounded by a constellation of opera stars. A chorus of Chapman alumni vocalists convened at their alma mater to mark the momentous occasion. The audience listened, dazzled by the sonic firepower onstage, further amplified by the hall’s enveloping acoustics, which resonated with the perfection of a finely tuned instrument. 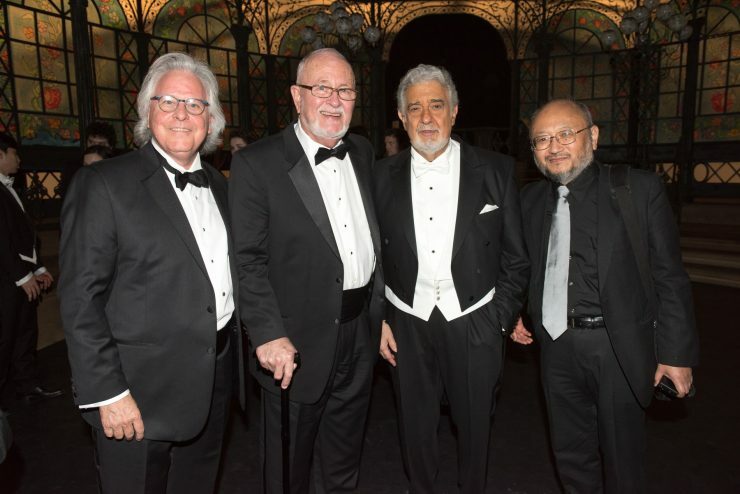 Immediately following the Grand Opening performance, Dean and Artistic Director William Hall greets Plácido Domingo as Executive Director Richard T. Bryant and acoustician Yasuhisa Toyota look on. Musco Center photo by Doug Gifford. Ten days later, more than 10,000 people converged for Musco Center’s Community Open House and Arts Festival. The event highlighted artists and organizations from surrounding communities: Mexican, Vietnamese, Anglo, Indian, Korean, Hawaiian, Jewish, and more. For Southern California at large, and for North Orange County specifically, Musco Center further raised Chapman University’s flag as a home for creativity, innovation, and community. 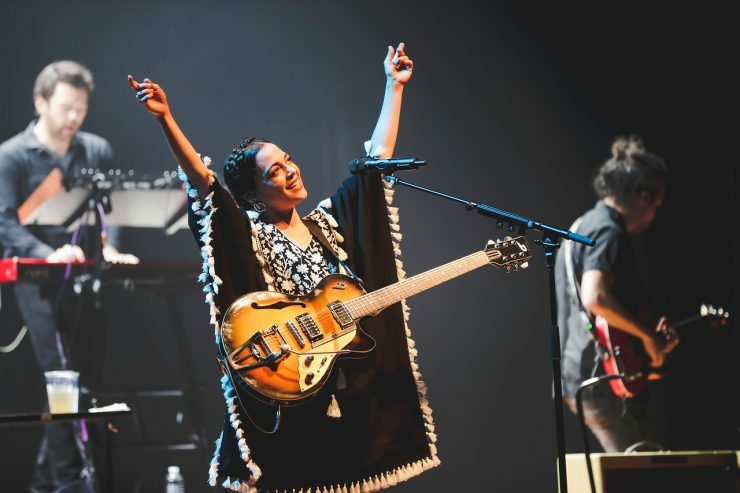 Mexican folk and pop icon Natalia Lafourcade headlined the 2018 Heartbeat of Mexico festival. Musco Center photo by Daniel Reyes. As an important new destination at a burgeoning nationally recognized university, Musco Center stepped into an ambitious mission published in the Opening and Preview Season program book: to offer students and faculty the opportunity to achieve the highest standard of arts-related education through hands-on, real-world production and performance experience; feature the work of visiting artists and companies that define excellence; engage and honor the many nearby communities; and provide exemplary audience experience and service. 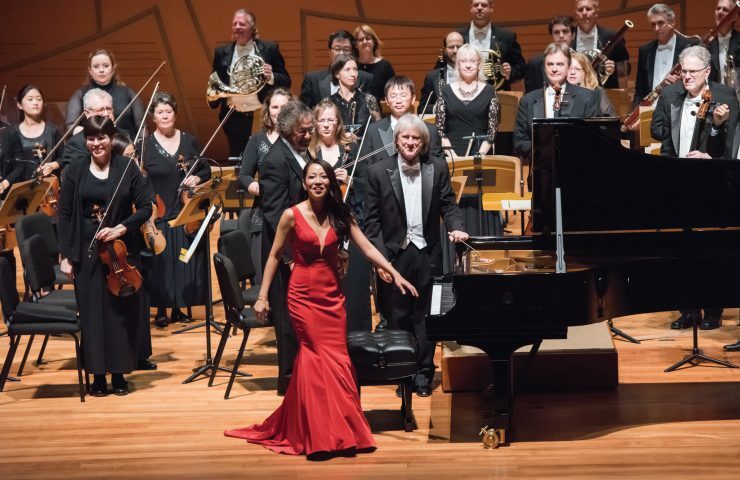 Pianist Grace Fong, director of keyboard studies at Chapman’s Hall-Musco Conservatory of Music, concludes Grieg’s Piano Concerto with Pacific Symphony and conductor Carl St. Clair during the Community Open House and Arts Festival on April 2, 2016. Musco Center photo by Doug Gifford. Although, amid all the opening fanfare, it may have seemed that Musco Center had rather suddenly appeared on the county’s arts scene, the hall was actually the product of many decades of hoping and planning by persistent leadership. That groundwork was followed by years of steadfast fund-raising, concluding in two years of construction and craftsmanship. 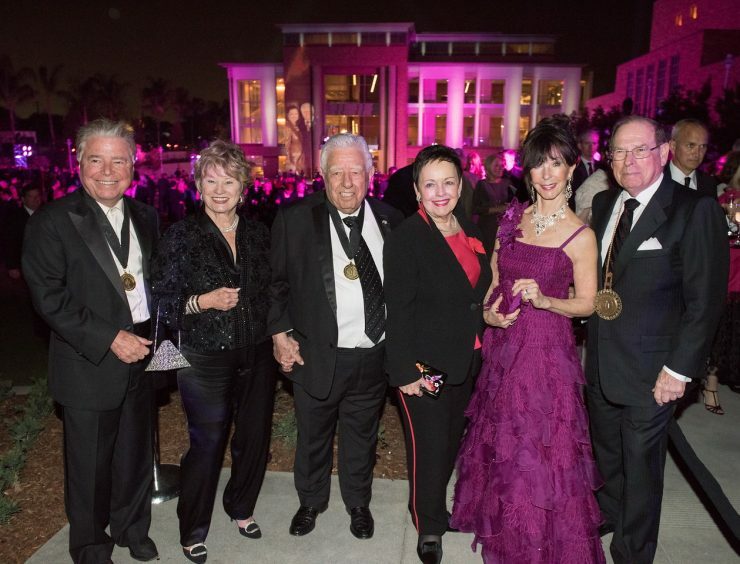 Musco Center is grateful to the benefactors, patrons, founders, and university leadership who are committed to the vision of a world-class performing arts center at Chapman, including founding benefactors Marybelle and S. Paul Musco, founding dean and artistic director William Hall, and founding executive director Richard T. Bryant. The story of Musco Center cannot be told without the story of William Hall, D.M.A. At Chapman since 1963, Hall has become an icon of music pedagogy and a champion of vocal performance in Southern California: as professor of music; as founder and dean of the College of Performing Arts; and now, as founding dean and artistic director of MuscoCenter for the Arts. The William Hall Chorale and Orange County Master Chorale, which he directed for many years, performed for presidents, popes, and kings. He has guest conducted many symphony orchestras, including the San Francisco Symphony, Vienna Symphony, and London BBC Symphony. Throughout his travels at the world’s best performance venues, Hall kept meticulous notes on how to create a purpose-built performing arts center at Chapman, to enable students and the community to create and present art in its highest forms, in an intimate and beautiful hall with the finest acoustics, technology, and audience experience. The dream became a reality with the advent of visionary Chapman benefactors Marybelle and S. Paul Musco. The Muscos’ passion for education and artistic excellence is reflected in their generosity through vital gifts that became the anchor to launch the funding effort for the Center’s $82 million construction cost. The couple’s constant, dedicated support has accelerated the Center’s rise to one of the top university-based performing arts facilities in the nation. Lead benefactors Marybelle and Sebastian P. Musco (center) are joined by Wylie and Bette Aitken (left) and Julianne and George Argyros (right). The generosity and vision of these families is manifest in the Musco Center and enriches Chapman University and the entire community. Musco Center photo by Doug Gifford. The arrival of influential arts leader Richard T. Bryant as Musco Center’s opening- year consultant gave the developing venue professional guidance on a nationally respected level. Following his appointment as executive director, Bryant has consistently championed an emerging model for university-based performing arts centers. Under his leadership, Musco Center’s programs explore how performing arts and thought leadership can advance the thinking and values of our time. at 30 different presentations — indoors and out —including professional and student ensembles, as well as lectures from international thought-leaders. Following the opening season, Chapman spent the summer putting the finishing touches on the Musco Center construction, while the Musco team refined its programming and operating plans. In the first full season —October 2016 to May 2017—community demand for the facility far exceeded expectations. That year had originally been forecast to host 61 events, but by the end of the year, 89 events were featured, including NASA astronaut Scott Kelly, violinist Ray Chen, jazz diva Dianne Reeves, banjo virtuoso Béla Fleck, an opera based on a ninth century Vietnamese folk tale and the second annual Heartbeat of Mexico Festival. 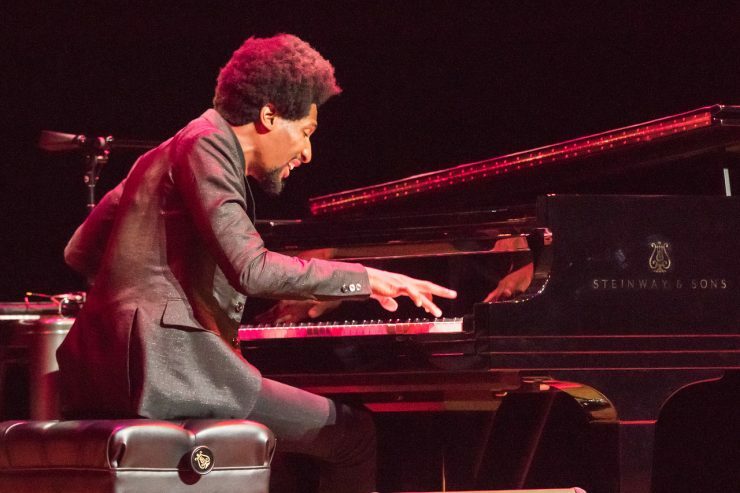 Jon Batiste, bandleader of the group Stay Human and the house band of The Late Show with Stephen Colbert, performed an intimate one-man romp through the history and future of jazz. Musco Center photo by Doug Gifford. In seasons two and three, Musco Center offered an ever-deepening context of artistic and intellectual undertakings. Plácido Domingo starred in two operas in concert—Nabucco in 2017 and Don Carlo in 2018—with the LA Opera Orchestra and Chorus. 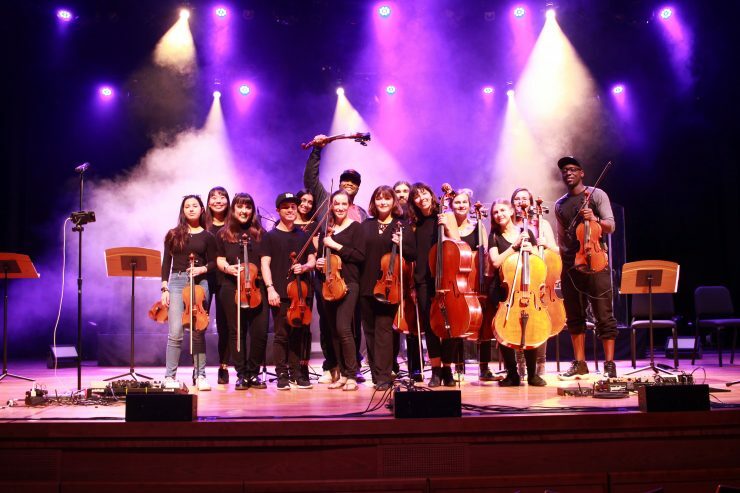 Students joined professional musicians during classical crossover act Black Violin, big band Stan Kenton Legacy Orchestra, and the live orchestral accompaniment for Disney:Beauty and the Beast in Concert. The third annual Heartbeat of Mexico expanded to two days, including a sold-out headline night with Natalia Lafourcade. 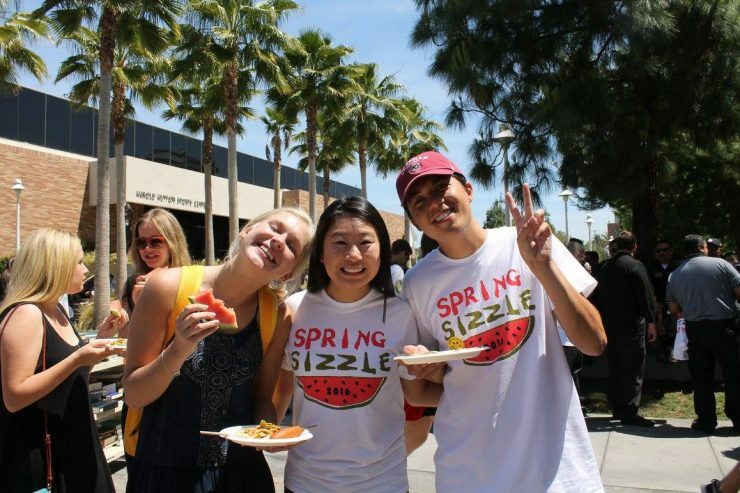 In addition to traditional academic pursuits, Musco Center offers Chapman University students, in close collaboration with the College of Performing Arts, the opportunity to achieve the highest standards in arts-related education. This goal is attained through hands-on, real-world production and performance experiences. Viral hip-hop/classical crossover stars Black Violin were joined by string students from Chapman University’s College of Performing Arts for the encore of their performance. Musco Center photo by Wesley Pinkham. A majority of the Chapman student musical ensembles from The Chapman Orchestra to the University Choirs and Big Band perform regularly on the Musco Center stage. Opera Chapman presents fully produced operas and opera scenes at Musco Center. Chapman’s Department of Theatre also takes full advantage of Musco Center’s state-of-the-art performance facilities. This includes past stagings of memorable musical productions Cabaret, Tommy and the puppet-driven Tony winner Avenue Q. 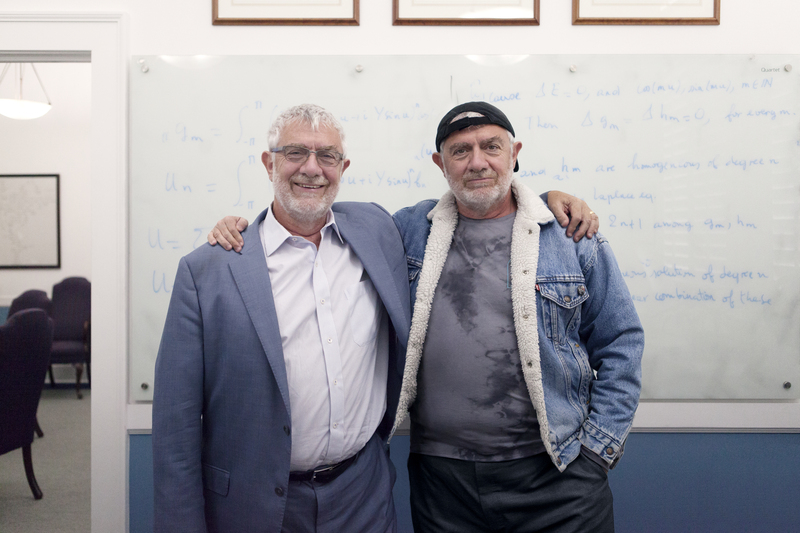 A sold-outguest-star-studded production of If All the Sky Were Paper featuring Annette Bening and Ed Asner allowed current Chapman students and alumni to share the stage with professional actors. Annually, an all-student cast rehearses and performs in the Broadway-worthy song-and-dance revue Chapman Celebrates, a benefit event which has raised more than $35 million for the university since its inception. While in residence at Chapman, Pilobolus embedded its principal dancers into dance classes and taught BFA dance students how to create Pilobolus-style choreography. Musco Center photo by AR Photography. From an architectural perspective, Musco Center was built with intimacy and student performance at its core. The stage —62 feet wide and 50 feet deep—can accommodate large ensembles from the College of Performing Arts. The full Wagnerian orchestra pit accommodates 72 musicians. With only 1,044 seats, no one in the audience is far from the creative fire. 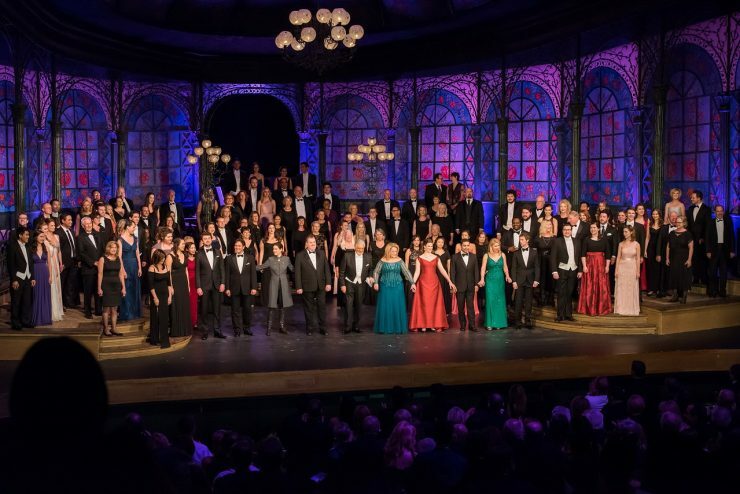 The stage can support more than 150 performers during shows such as LA Opera’s Nabucco in Concert starring Plácido Domingo or the annual A Southern California Christmas. That means there is an impressive 1:6 ratio of performers to audience members. For students, performers, and the general public, the immediacy and magnitude of these artistic experiences offers a catalyst for the transformative and healing power of art, science, and community. In the three years since its opening, Musco Center has presented or hosted nearly 300 events—inside and out—with attendance of more than 160,000. Students regularly participate in master classes with visiting artists. Presentations and rentals from local communities bring countless new families to the Chapman campus. at this third anniversary, Musco Center is a celebration of creative energy and inspiration, bridging the divide between arts, creative thought, and science and highlighting the pinnacles of human achievement. Display image at top/ Pianist Grace Fong, director of keyboard studies at Chapman’s Hall-Musco Conservatory of Music, concludes Grieg’s Piano Concerto with Pacific Symphony and conductor Carl St. Clair during the Community Open House and Arts Festival on April 2, 2016. Musco Center photo by Doug Gifford.